The first little snippet from my “Japanese Sampler” is the Sailor Otehon mechanical pencil. It’s an all plastic, lightweight yellow pencil, of average length and weight. So what’s noteworthy about it? Well firstly, it’s rather unusual in that it’s an ordinary push top ratchet mechanism, but it uses 2mm lead, and it comes preloaded with 6B grade lead. Actually I wouldn’t have said it was 6B lead - it’s quite dark but is quite hard. Still, 6B is what’s on the package. Now I don’t read Japanese, so was a bit puzzled by the large instruction sheet and detailed diagrams. Also the grip is rather unusual in that it has a rib running around it. 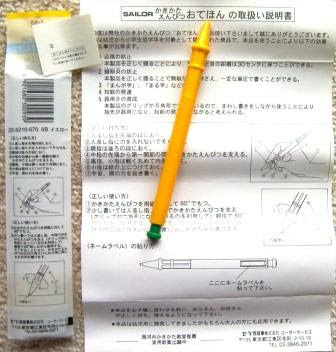 It all came together when I found out that the pencils name, “Otehon”, translates to “Example”, and that this pencil is intended to help correct (little) folk who hold their pencil incorrectly, hence all the diagrams and instructions. The rib around the lower part of the grip is to help with correct finger positioning. 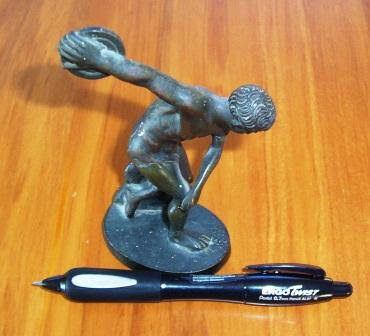 It also comes with blank little name-tag stickers that go on a flat spot moulded at the top of the pencil. Help keep those annoying classmates from snaffling your pencil. I normally associate Sailor with expensive prestigious fountain pens, so a basic lightweight pencil was quite a change. Somehow I missed the Ohto Super Promecha for a few years. I had actually viewed it online, but seemingly in some sort of defensive reaction, the logical part of my mind must have tried to protect me from the “collecting” part my mind, and so I glossed over all the super-adjustability of it all, and it just didn’t register with me. A case of self-induced “screen-blindness” or something? 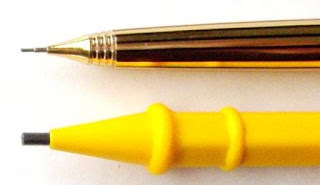 Anyway, last year a reader contacted me about the Super Promecha, and made the comment, “THERES NO NEED FOR A PENCIL LIKE THAT! ITS WILD CRAZY DAVE!” Clearly it was time for me to look again, and to get myself one. Before I go any further, if ever there was a mechanical pencil that needed instructions, then the Super Promecha is it. As far as I can tell it isn’t officially released on western markets, so the instructions are not in English, and you really do need instructions. So, here’s my version of the Ohto Super Promecha instructions. Just look at the thing – silver metallic colour, hexagonal body, cut-out sections and springs and adjusting grip wheels everywhere - this pencil really looks “technical”. It just screams out “designer”, “engineer”, etc. This is not a pencil for “ordinary people”. Right then, picking it up, the first thing that I noticed was that it was a little lighter than I expected. It actually weighs in at about 28 grams, so the aluminium construction keeps it relatively lightweight. Most of the weight is at the front end with the large grip section and all those adjustable mechanisms, so this is definitely a front-heavy pencil. Well straight off the bat, I don’t like that. The large front-heavy grip and thinner lighter body somehow combined to give me a feeling that it was sort of flapping around a bit in my hand, particularly when not holding it tight. It reminded me of some sort of pendulum - you hold the weight at the end and the suspension rod just waves around. The grip itself is a very fine diamond cut pattern, so you certainly get good positive grip, but it’s quite gentle on the skin, not a rough cut pattern. OK, so lets start at the front and work our way up the pencil. What length of lead sleeve to do prefer? Well, you can set it between 0 and 4mm. That first little wheel and spring mechanism (1) sets the maximum length of your lead sleeve. Then you advance or retract the lead sleeve (for pocket safety) by winding the big grip section (2) around. So you could wind the grip section around just a little bit and only half-retract the sleeve, or all the way to fully retract it. Similarly when extending the lead sleeve, you wind the grip around to extend it out, but its maximum extension is determined by the preset little wheel and spring mechanism at the tip. Overall, not a bad idea, but it would be miles more convenient if the lead sleeve retracted with a simple push like it does on most pencils. Of course if you have wound the sleeve back in and you want to write a quick note or something you don’t need to advance it out, you can just push the top cap and advance some lead and write. But I noticed this leads to problems with lead breakage, which is very unusual for me with 0.7mm leads. The Super Promecha comes in a wide variety of lead sizes. 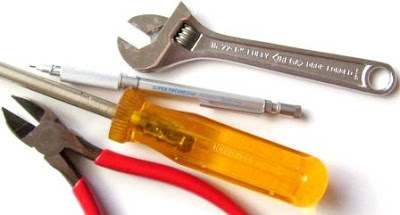 One final note, don’t wind the grip back good and hard, as it might just get stuck; and like me, you’ll need to resort to pliers and spanner to un-wind it again. The next thing you can set is the lead advance length. You do that with the grip wheel adjuster (3) at the top of the grip section. The Super Promecha uses an ordinary push top ratchet lead advance mechanism, but the adjuster allows you to set the lead advance per click anywhere between 0 and 2mm. This is a very interesting idea, but unfortunately reality does not quite live up to expectation. I noted a tendency for the mechanism to skip the shorter the lead advance setting. So, if you set it for 2mm advance per click, and then clicked it 10 times, you would end up with 20mm of lead extended. But if you set it for 0.5mm advance per click and clicked 10 times, you might not end up with 5mm of lead, because it skipped (didn’t advance the lead) on one or two of the activations. This problem was definitely related to the lead advance length setting. The shorter you set it, the more likely it was to skip. Well, how does it go at getting graphite onto paper? Firstly I noted I could hear a little rattle when writing. There’s less rattle if the lead is in continuous contact with your paper, but as soon as its raised and lowered in the course of general writing or drawing, you hear it. The noise is actually the push-top button rattling in contact with the body. Next, the lead is not held all that firmly in the sleeve. In comparison to some other technical draughting pencils I’ve got, when tested with the highly scientific “wobble it between your fingernails” test, the Super Promecha does have a little more lead wobble than most. Next on the way up the body is the pocket clip. It’s lightly sprung and quite good. It is removable, by unscrewing the grip wheel (4) holding it in place. Finally we reach the top button, which of course activates the push top ratchet lead advance mechanism. 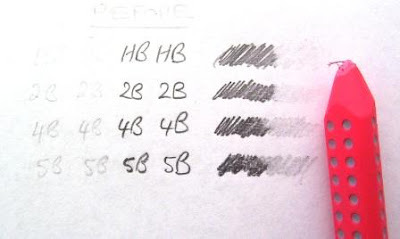 It contains a lead hardness degree indicator (5), which you set from B to 4H, including grade F which is a nice touch. Clearly these lead grades indicate Ohto’s intention that this is a technical draughting pencil. There is a small eraser under the top button, with a needle to help clear lead jams. Personally I have very few such lead jams with any pencil, but with all this super adjustability you just might need a needle with this pencil. My pencil came in a small simple plastic protective carry sleeve. I was full of anticipation when I received my Super Promecha. Clearly it promised much, but I must confess that something just wasn’t quite right, that overall I was disappointed with it. Much of this could have been unfair expectations. Sometimes it is a fine line between techno-supergadget and gimmick. Now that I have experienced the Super Promecha’s features first-hand, for me personally, I think that overall this pencil has put one foot just over the line, just stepped into the ‘slightly gimmicky’ and ‘disappointing’ area of the field. However, I’m sure a lot of people, and many Ohto users, will disagree with me. Best Points – All that adjustability, particularly the lead advance length. Not So Good Points – Cumbersome lead sleeve retraction, and for me personally, front heavy balance. 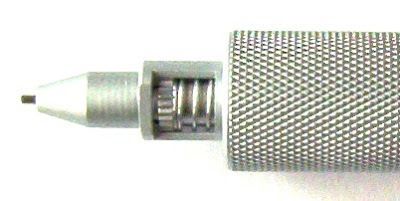 Dimensions – Length 153mm, diameter 10mm at grip. Balance point about 60mm up from the tip. Well there I was in a great big “Stationery City” sort of place, and these Faber-Castell Grip erasers were on sale for some ridiculously cheap price. It was an offer to good to turn down. 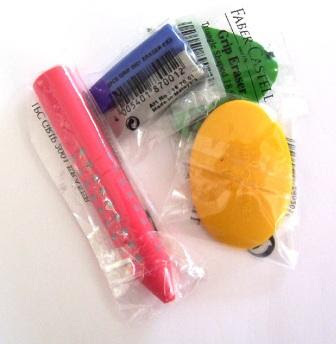 The 2001 Pencil eraser and 2001 Eraser Caps have “Made in Malaysia” on their clear plastic wrapper, but the other two are silent about their country of origin. With the exception of the 2001 Pencil shape eraser, they all are silent about their material of manufacture – no claims of “Child-Safe PVC Free”, “Non-PVC Formulation”, “Dustless”, “Vinyl” and so on. 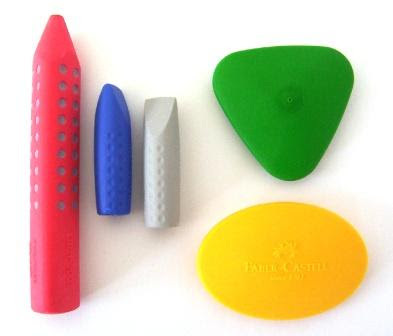 The 2001 Pencil shape eraser has “PVC Free Eraser” moulded into it, if you go looking, but its pretty inconspicuous really. All of them do however have “Faber-Castell” moulded into them. So, Faber-Castell are proud of them, but they don’t want to make much noise about their material? I must say that I’m pretty unimpressed by declarations of “PVC Free”. Thanks for telling us what it isn’t, how about telling us what it is? What really attracted me to these erasers was the shapes were obviously designed for precise erasing. The Pencil has a point, the Caps have chisel edges, the Oval and Triangle have fine thin edges and curves, obviously all designed to erase small precise areas. The first thing I noticed when I picked these erasers up was how hard they are. Your fingernail doesn’t make much of an impression in them. Very little give in the compound compared to the other erasers (Staedtler, Faber-Castell, Owl, Uni, etc) that I’ve got lying around. 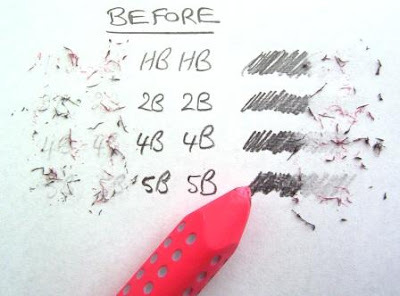 This made me rather suspicious of how they would handle darker softer lead grades like 2B or 4B, and I wondered if they might be a bit harsh on the paper. Time to put them to the test and answer these questions. Firstly they are all very nice to hold. Very conveniently shaped to fit in your hand. I deliberately used them on an appropriate angle, to try and maintain their edge or point, and it seems you can do this reasonably successfully. Despite their hardness they don’t seem overly harsh on the paper, but I’d still be cautious with something delicate. Starting off, a selection of writings in different grades of pencil lead. Now for a bit of erasing - note all the fine short waste produced. After a bit of a clean up you can see the HB lead was erased quite successfully, with performance decreasing as the lead got softer and darker. 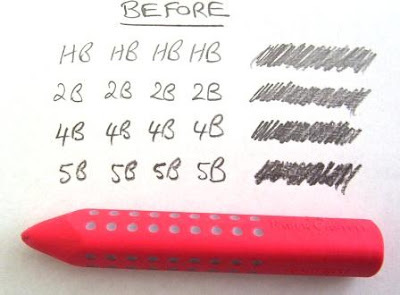 Finally Staedtler Mars Plastic was used to erase the middle section (shown un-erased in the photo above). You can hopefully see that with HB and 2B they are pretty equal, but the Mars Plastic removed a bit more of the darker lead grades. 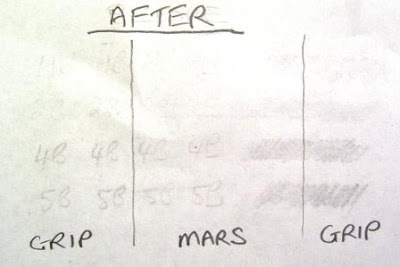 Initially the Mars smears the darker lead grades all around the place, but then removes them. On the other hand the Grip eraser doesn’t smear them, as it just wears away quickly. Overall then, I am very impressed these Faber-Castell Grip erasers, they are well worth checking out to see if they might suit your specific requirements. Recently I reviewed the somewhat similar Pentel Flex Fit II, so it’s natural to have that in the back of mind when reviewing the ErgoTwist. The main feature (or gimmick) of the Flex Fit II and the ErgoTwist is the customisable rubber grip. Aesthetically, I like the ErgoTwist a lot more than the Flex Fit II. The grip on the ErgoTwist is smoothly contoured into the body of the pencil, and they have attempted to get something of a streamlined flowing balanced look about the pencil. With that in mind, the rather sharp angular transition to the front tip section is somewhat out of place. The pocket clip is a rather heavy integrally moulded clip, but quite good as far as such plastic clips go. There is a small eraser under the top cap. You can easily get the cap on and off without activating the lead advance. Not surprisingly, the pencil mechanism is a push top ratchet. The tapered lead sleeve is not retractable so it’s only suitable for general writing, and its not pocket-safe. My ErgoTwist is a 0.7mm lead model which appears to be the only lead size offered, but there are several body colours to choose from. Although it looks fairly substantial, the ErgoTwist is actually quite lightweight, and the balance is fairly neutral. 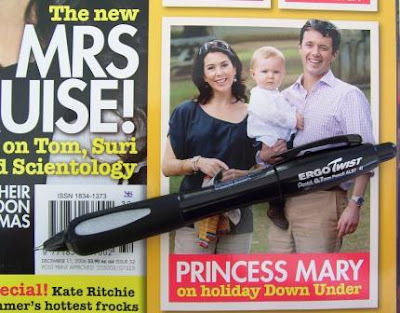 Pentel advertise the ErgoTwist as having “an ultra-soft, adjustable grip that twists to an individual’s comfort level and cushions to fight against finger fatigue.” It has been recognised as an “Ease-of-Use product by the Arthritis Foundation”. Well first off I would have to disagree about the ultra-soft description. You won’t have to look very hard to find a pencil with a softer grip. Certainly it’s softer than many rubber grips, particularly Pentels, but many cheap foam grips are softer. Then there are grips like the Sensa plasmium and its imitators. All of these are much more worthy of the wording ultra-soft. Personally I would describe it as a medium hardness grip as there is a little “give” under normal hand pressure. The twist customisation of the ErgoTwist is not as good as that of the Flex Fit II. You can twist it to either side, but the twisting only starts about one-third of the way up the inserts. So, if you are like me and tend to hold the pencil down towards the start of the inserts, then you aren’t fully in the “twisted zone”. The pictures below show the grip in its normal position and twisted my preferred amount. You can see how the twisting only starts part way up the insert, and actually only the centre section is being twisted. The black rubber is quite grippy, but the silver inserts are even grippier. I suppose there’s every chance they are actually the same compound and I’m embarrassing myself by claiming a difference in “grippiness”, but that’s the way they feel. There are three inserts spaced around the grip, and they are set into depressions, giving a somewhat triangular feel to the grip. So, long-time readers please make sure you are seated and prepared for a shock…this rubber grip is good, really good. If only they had the same twisting as the Flex Fit II then this would be getting scarily close to an A+. Actually the grip is a little large diameter for me, so if they could make it variable diameter, then wow, they might just take over the world. Best Points – Super grippy rubber grip. Not So Good Points – The grip is rather large, a smaller diameter option would be good. Better twisting customisation of the grip would also be good. Dimensions – Length 149mm, diameter 15mm at widest part of grip. Balance point about 75mm up from the tip. Recently this selection of mechanical pencils arrived in my letterbox. A “Sampler from Japan”, a selection of pencils sent to me by a very nice fellow in Japan. This bunch of pencils really has reinforced my view of the world when it comes to mechanical pencils – Japan and Asia is where it's at. In comparison, us in the rest of the world really only get a lesser selection to choose from. You only have to look at the popularity of moleskins, notebooks, pens, etc, (and the eagerness with which people in your office will raid your supplies!) to know that a lot of people in the “West” have a stationery / office supplies thing going on, but when you compare that to the “East” and their endless proliferation of, and ever changing ranges, of stationery like “Hello Kitty” then it seems obvious that the stationery / office supplies thing is far stronger in the East. It’s not too surprising then that the dynamos of the mechanical pencil industry really are the Japanese and Asian companies. Well that’s all just in my humble opinion of course. One thing that does surprise me though is the lack of any highly prestigious Eastern pencil brands, well at least any that I know of. 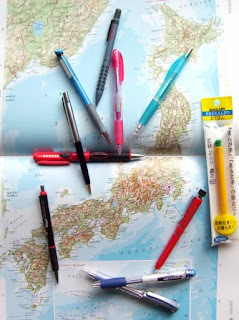 Not wanting to diminish Staedtler, Papermate, Faber-Castell and so on, but Japanese companies like Pentel, Pilot, Mitsubishi Pencil and Kotobuki rule the economy and lower price ranges. However they start fading away in the mid price range, and seemingly no Asian companies really compete in the higher priced end of the market. If you want a very prestigious pen, then Japanese companies like Namiki, Sailor or Platinum are very happy to empty your wallet, but when it comes to mechanical pencils, then companies like Mont Blanc, Caran d’Ache, Yard-O-Led, and Pelikan are without eastern competitors. I find this rather strange. The Asian countries have strong traditions of calligraphy, they have prestigious pen companies, Japan was an important player in the infancy of the mechanical pencil industry, mechanical pencils remain very popular in Asia…why then this gaping hole in the higher priced segment of the market? Well again, that’s all IMHO. So, coming soon, a few snippets on a few of these samplers from Japan. For quite a while I have wanted to get some Koh-i-noor 0.5 and 0.7mm leads. It’s not too hard to find their 2mm leads for clutch pencils, but their thin leads seem conspicuously absent from the internet. Recently I found an online retailer that listed them and shipped internationally, so I went to order some, despite the rather high minimum shipping fee they charged. However, when I got to the checkout stage on the website, it started putting “Or code XXXX” next to my Koh-i-noor leads so I started to worry they might be going to substitute some other range of leads. I suspended my order, and emailed customer services. No problem they told me, they had checked, the Koh-i-noors are being deleted, but they are still in stock, so order away. I did, and I also noted in the comments section on the order form that they must be Koh-i-noor leads, no substitutes. A little later I received an email confirming my order was ready to ship if I would approve the shipping fee. I said sure, but please double check they are Koh-i-noor brand leads… so who wants to bet that I received Koh-i-noor leads? Well at least they agreed to credit me for the price of the leads and call it quits. Still it does leave me out of pocket quite a bit. But hey, I like to find something positive wherever I can. Now, of all things, these guys were a US forestry supplies company! Yes, that’s right, forestry supplies. But they had a small selection of pencils, draughting supplies, ‘write in the rain’ paper, etc, including Koh-i-noor leads. Obviously for forest supervisors and managers. So, when I opened up my parcel, they had included a one page flyer on their range of Snake Protection. SNAKE PROTECTION!!!! FANTASTIC! Talk about trying to get some add-on sales. I buy a pencil and they try and sell me snake proof clothing! Now we don’t have snakes here in New Zealand, so I’m not really up with the play when it comes to snakeproof chaps and gaiters, snake boots and snake handling tools. But I am now! 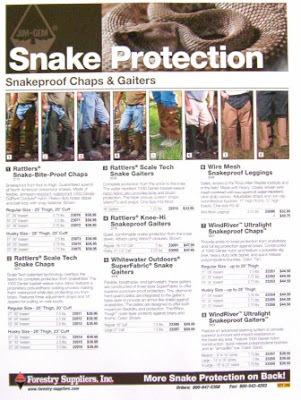 ‘Rattlers’ Snake-Bite-Proof Chaps or ‘Whitewater Outdoors’ Superfabric Snake Gaiters, guaranteed flexible, breathable and lightweight - who even knew this stuff existed! Might just have to get me a pair, just in case like. And then of course, the box was filled up with those spongy plastic foam “peanuts”, and there was this little brochure. “This package contains Bio-Pak Packing Pellets”. They are “…derived from starch and other bio-degradable ingredients which are harmless to the environment and dissolve when exposed to water or rain. They can even be composted…try it yourself, drop a bio-pak pellet in water and watch it disappear”. I was thinking, hey, a little salt, some sauce, a bottle of beer, might not be a bad snack, a new way of environmental recycling...until I read the final line, “CAUTION – Packing pellets can be harmful or fatal if swallowed”. But maybe they mean just a choking hazard? Back to the problem at hand, anyone know how or where to get Koh-i-noor thin leads?